Eve has lived a life of privilege and loss. She has no boyfriend, hardly any friends, and her focus is on school. Her father died in a tragic accident, leaving her only with her mother. Her only friend, Aislin, couldn't be more opposite of her and needs Eve to rescue her. The two are ying and yang, but in a very good way. The only thing that has ever come between them is the cold and untouchable Terra Spiker....Eve's mother. Terra is a brilliant scientist and the brains and power behind Spiker Biopharmaceuticals, a cutting edge medical industry melded with technology. And it's there that Eve is sent after she is in a fatal accident that crushes her leg and leaves her comatose. In order to ease the boredom of recovery, Eve's mother introduces her to an advanced genetics video game that is under consideration for marketing. The game allows the user to create their own human from the ground up, selecting DNA and genetics to create perfection. Eve sets to work, and Solo silently watches the progress. Little do they know what's truly being put into Eve's hands or the mastermind behind what Spiker Pharmaceuticals is hiding. 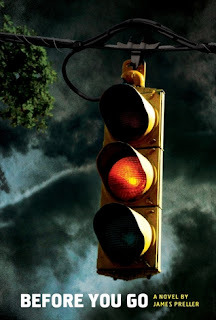 Set in today's time in San Francisco, this book is a science thriller from start to finish. The two dominant voices written by two distict authors creates a layer of intrigue for the reader because that is the only one who knows the thoughts and actions of Eve and Solo. This type of book is rare to come by...not quite dystopia but with the elements for the possibility of that kind of society...a pre-cursor, if you will. 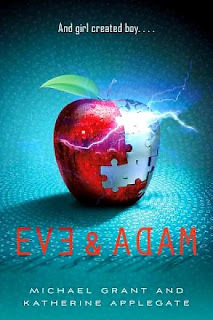 The other characters in the book create a rich backdrop for the action and relationships that soon start to form and each character begins to unpeel the layers surrounding Eve and Solo as well as their involvement in the entire plot. Although I'm not a huge reader of science-based fiction, I devoured this one. Loved it! If you like books such as Werlin's Double Helix. Bodeen's The Gardener or Brooks's Being, this is one to pick. Recommended for high school. Jude is starting summer off like any typical teen...finding a job. And lucky him, he lives close to the beach and employment opportunities at the food stands are abundant. What Jude really wants is what most guys want before their senior year - to hang out, find a girl, go to good parties. He's coming out of a long downward spiral, starting with the death of his little sister Lily, who died when Jude was nine. His mother still hasn't let go, and his father runs, literally and figuratively, from home. The only light in his life is his best friend Corey, and the "brodowns" they have when they hang out. Jude is starting to come back to life. His new job is part of living again in the real world. Then, tragedy strikes Jude's life again, and when it does, it hits him hard, strong and fast. He's managed to survive and get through one he'll never forget, but is this one too much for him? Preller begins this book with a powerful scene and ends it with one as well. What makes this book a recommended read is not necessarily the characters or the style of writing but the book itself. With short chapters, it's easy to digest and an excellent pick for a reluctant reader. Jude's character is one that guy readers will relate to, from the video games to music to his conversations and interactions with his friends. This, too, makes it the perfect book for a guy. I could relate well with the characters and the plot without becoming overwhelmed with intentional theme. This is a book that could be read in a day or two...quick, fast and pretty tasty. Recommended for reluctant readers upper JH to HS. There used to be a time when I was excited about the newest and best out there, using the programs and huge creativity of people's minds to share web 2.0 content and how it could be utilized. But then the inevitable happened - I began to focus on what could be used in the classroom and library and the edges got blurry. No longer did I need to know more, I needed to use more of what I already knew! And the pool of web content and tools for the classroom began to grow stagnant. It was a slow and gradual process until I looked down one day and saw the green and realized I needed some chlorine....fast! My Delicious pool is getting green!! So, what are those websites I focused on to create that stagnancy? You know them....Prezi, Animoto, Voicethread, Glogster, Wix, Weebly. The bookends of excellent educational technology, as well they should be. They've earned the right to be there. But what do I have between those bookends that I can pull from and train, teach and expand student engagement and teacher knowledge? I need to fill in the bookends with new ideas and technologies to pull, learn and teach the campus I work with so I don't have to sit and watch the millionth Animoto or the two millionth Prezi....know what I mean? And thank you Kristin Fontinchiaro for reminding me: It's about focus and balance, not about creativity and a project done. Educational technology should showcase the learning, not the product. And yeah, I'm reading some good YA novels too! !